Celebrities from different walks of life come together to make March a Women's Day Month at the Brahmakumaris International Women's Day Celebrations in Mumbai. 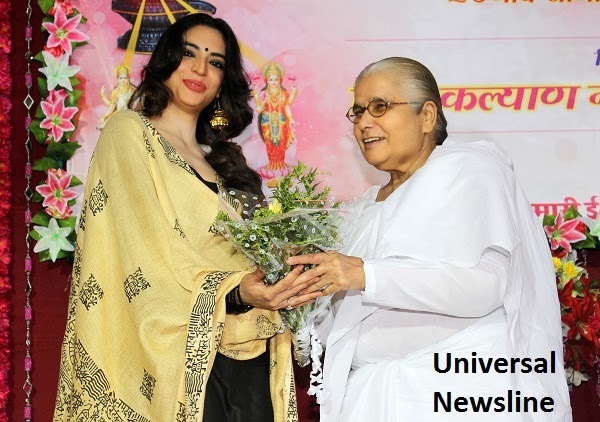 Mumbai: Brahmakumaris celebrated - International Women's Day a Non profit NGO affiliated to United nation and with 8500 center across the globe has been constantly working for woman empowerment and issue related to the same cause. Every year the NGO organizes several events and take numerous initiatives to spread the messageof strengthening woman power at every level in society. Continuing the same effort, a very crucial event by the Brahmakumaris annually is the Women's Day celebration that is conducted at different centers all over the country where well known people from different walks of life register their presence and share their valuable wisdom. This year the event was chaired by Rajyogini BK Santosh Didi and was attended by personalities from Politics, Police, Entertainment, Media amongst others. Actor Shweta Bharadwaj & Tanisha Singh, Singer Shabab Shabri, Actor – Model Sahil Anand, Corporaters -Naina sheth & Alka Doke, Inspector of Traffic Police - Sujata Patil were present at the event to support the social cause and create awareness by interacting with hundreds of women present. On the occasion, sharing the initiatives the NGO has been taking for over 60 years, Rajyogini Santoshji - Head of Maharashtra & Karnataka zone said, "Our efforts are to portray the need of inculcating spiritualism by women at every home in today's challenging times.Year on year Brahmakumaris have been conducting various programs on women’s empowerment all over India and several achievers like Hrithik Roshan, Priyanka Chopra have supported our past events and i am thankful to all of them to be standing for such an important cause." Actor Shweta Bhardwaj says “To thank my mom or my sister, I actually don’t wait for a day in particular but yes Women’s Day is one such occasion where I feel very proud to first be a Woman and second admire the sense of pride and responsibility my mother and sister have brought me up with. This Woman’s Day i celebrated with the Brahma kumaris, an organisation who is working towards Women Empowerment and I am proud of such organisations who take several initiatives for the betterment of the most important creation of God – Woman”. Actor Sahil Anand adds “For me its not about celebrating women’s day on a particular day as the most important person in my life is a woman – my mother but yes, this time i will be attending the annual event by Brahmakumaris a non profit NGO, who invited me as a guest to be part of their celebrations on Women Empowerment”.